Item #176: A fire drill. No, not an exercise in which occupants of a building practice leaving the building safely. A drill which safely emits a bit of fire, the approximate shape and size of a drill bit. Item #74: Enter a lecture class in street clothes. Receive loud phone call. Shout “I NEED TO GO, THE CITY NEEDS ME!” Remove street clothes to reveal superhero apparel. Run out for the good of the land. Item #293: Hypnotizing a chicken seems easy, but if the Wikipedia article on the practice is to be believed, debate on the optimal method is heated. Do some trials on a real chicken and submit a report . . . for science of course. Item #234: A walking, working, people-powered but preferably wind-powered Strandbeest. Item #188: Fattest cat. Points per pound. 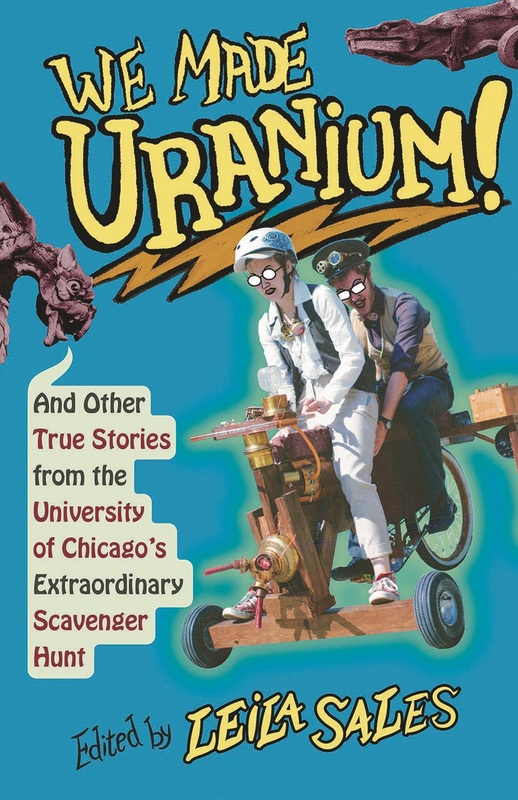 The University of Chicago’s annual Scavenger Hunt (or “Scav”) is one of the most storied college traditions in America. Every year, teams of hundreds of competitors scramble over four days to complete roughly 350 challenges. The tasks range from moments of silliness to 1,000-mile road trips, and they call on participants to fully embrace the absurd. For students it is a rite of passage, and for the surrounding community it is a chance to glimpse the lighter side of a notoriously serious university. We Made Uranium! shares the stories behind Scav, told by participants and judges from the hunt’s more than thirty-year history. The twenty-three essays range from the shockingly successful (a genuine, if minuscule, nuclear reaction created in a dorm room) to the endearing failures (it’s hard to build a carwash for a train), and all the chicken hypnotisms and permanent tattoos in between. Taken together, they show how a scavenger hunt once meant for blowing off steam before finals has grown into one of the most outrageous annual traditions at any university. The tales told here are absurd, uplifting, hilarious, and thought-provoking—and they are all one hundred percent true. Item 133, 2004: Does Their Relationship Lack Trust?